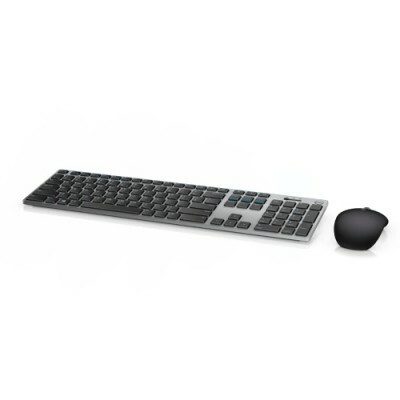 Boost your day-to-day performance with the Dell Premier Wireless Keyboard and Mouse - KM717. Easily navigate on almost any surface, including glass and high-gloss surfaces with the 1600 dpi laser mouse. The full sized keyboard features a 3-section layout with multi-OS support, plus the most popular shortcut keys for Windows and Android. With the choice of wireless connectivity, you can easily switch between three devicesâ€”desktop, laptop, and mobile devicesâ€”using 2.4GHz wireless or Bluetooth LE. The nano dongle connects both the mouse and keyboard, and up to six total compatible devices using 2.4GHz wireless Dell Universal Pairing (Dell.com/Pair). This provides you with one dongle for your compatible devices, whether at your desk or on-the-go. For increased productivity you can simultaneously pair up to two compatible devices with Bluetooth LE. The ergonomically designed keyboard and mouse allow you to work in comfort throughout your workday. The arc-shaped mouse brings convenient shortcuts to your fingertips with five buttons. Constructed of premium materials, the keyboard and mouse combo features an elegant design that will fit into virtually any workspace. With 12 months of keyboard battery life and 6 months of mouse battery life, you donâ€™t need to worry about running out of power during your busy day. Enhance daily performance and productivity with the Dell Premier Wireless Keyboard and Mouse - KM717, which features an elegant design that will fit into virtually any workspace. Enjoy the freedom to choose your wireless connection of Dell Universal Pairing or Bluetooth LE. A full sized keyboard provides a comfortable, productive typing experience and features a 3-section layout with multi-OS support plus the most popular shortcut keys for Windows and Android. The ergonomic mouse and keyboard are designed for comfort and constructed of premium materials. The Wireless Keyboard and Mouse combo features a long battery life so you wonâ€™t need to worry about running out of power during your daily activities.